Make Contact with ex-members:We are here for you 24 hours a day. Email: info@themanbehindthename.com or call: 402-218-9530 If you need a name or address of a former member call or write to us and we will try to re-unite old friends. Looking for scriptural education or a place to keep the Feast? Here is some links to some sites for enlightenment, education, or for possible fellowship in the faith. Approach each site with both eyes open, prove all things, and study to show YOURSELVES approved! Each has its own grade level of understanding and the information presented is for you to decide the value of each site! Yisrayl Hawkins websites to counter the TRUTH! Yisrayl Hawkins knows that ex-members are going to expose his lies and his deception. In order to counter any backlash, he allows members to set up bogus websites in order to make it look like the House of Yahweh and Yisrayl Hawkins are being persecuted because of their teachings out of the bible. Most people who leave or are kicked out of his religious cult, don’t have a problem with biblical teachings, just his twist on translation and interpretation! Once released from their religious prison, they know the truth of the man behind the name! And when they give their testimony, everyone has the same story, Yisrayl Hawkins has duped them, usually out of their finances! There are many who have contacted themanbehindthename, and have told of their marriages being destroyed by Yisrayl Hawkins mind control techniques! Here is a link to their counter offensive to the TRUTH, which is a paid, ad website, that they have set up on google! We are still reaching out to the world and if you want to be a part of missionary expeditions let us know, we are looking to go to Africa, India, and the Middle East this year. Contact Kepha: 402-218-9530 for more details. Since the information provided within this site, indicates that Yisrayl Hawkins doesn’t show care, concern, nor provide protection to the children; we have chosen to provide the following websites to bring awareness to you and your family so you may be aware who the child molesters are in Yisrayl Hawkins’s church. This public information is sensitive in nature and should be used to educate, not retaliate. Self-Titled, Overseer/Pastor Yisrayl Hawkins and his number one son, Elder Yedidiyah (Chris Jandrisevits) Hawkins, who is now serving 30 years in a Texas Prison for child molestation. This page is taken out of his “Book of Yisrayl.” This is truly two of Yahweh’s Most Wanted, for perverting truth, righteousness, and justice! 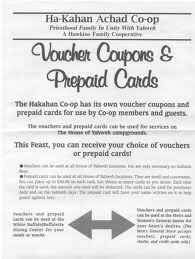 The members are encouraged to exchange their cash for voucher coupons which expire and can only be used at the 3 commanded Feast. Once purchased, they can’t be redeemed and expire at the end of the Feast. The members have useless paper and Yisrayl Hawkins has the cash! 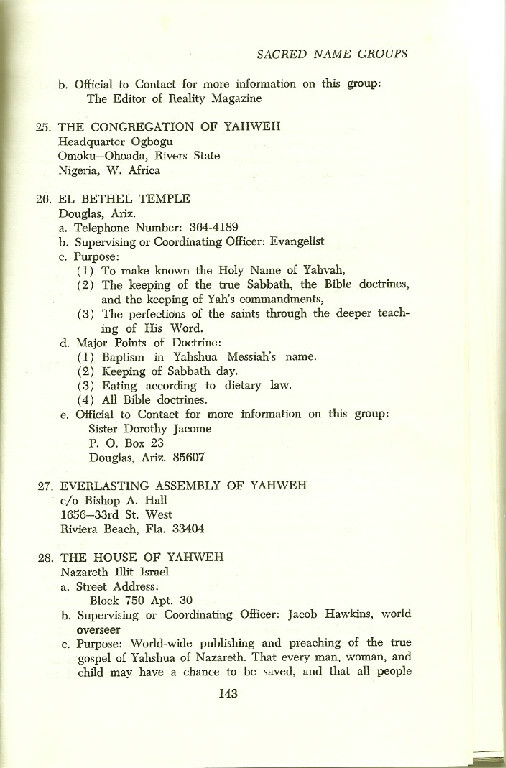 Several pages from the Sacred Name Observing Groups, 1974 edition: Another proof that Yisrayl Hawkins has lied about his claim to be the founder of the House of Yahweh. This book is another fact, that proves his, doctrine of establishment, to be another lie! 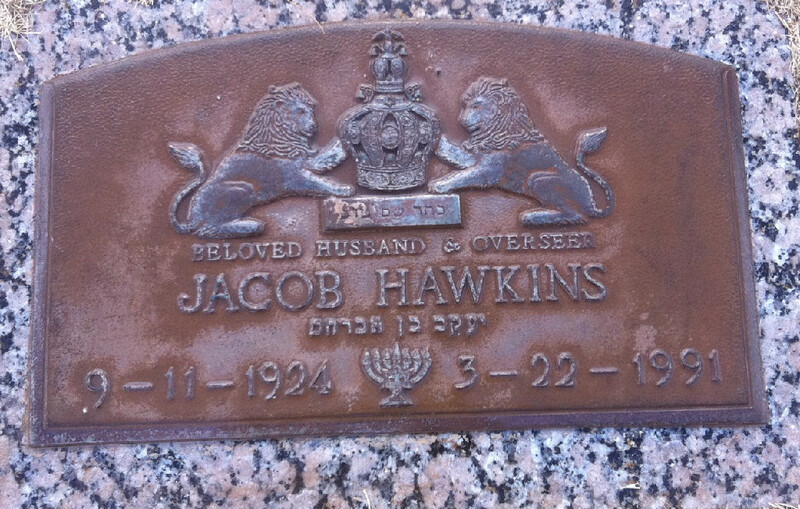 Jacob Hawkins (J.G. 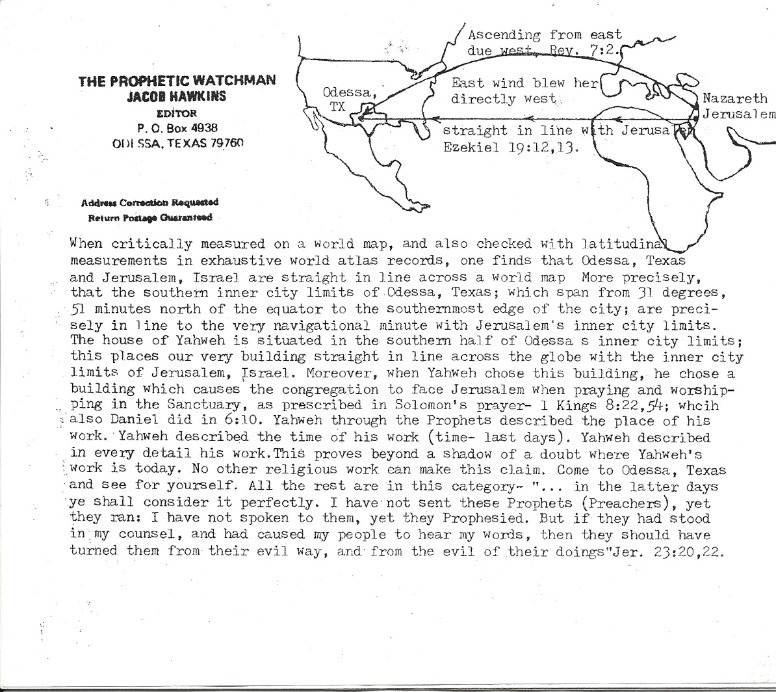 Hawkins) Prophetic Watchmen magazine, which reveals his doctrinal belief, why the House of Yahweh, had to be established in Odessa, Texas. According to Kay Hawkins (Yisrayl’s ex-wife) testimony, she said that Yisrayl read Jacob’s monthly magazine, religiously, locking himself in his office and pouring over the information contained within its pages. 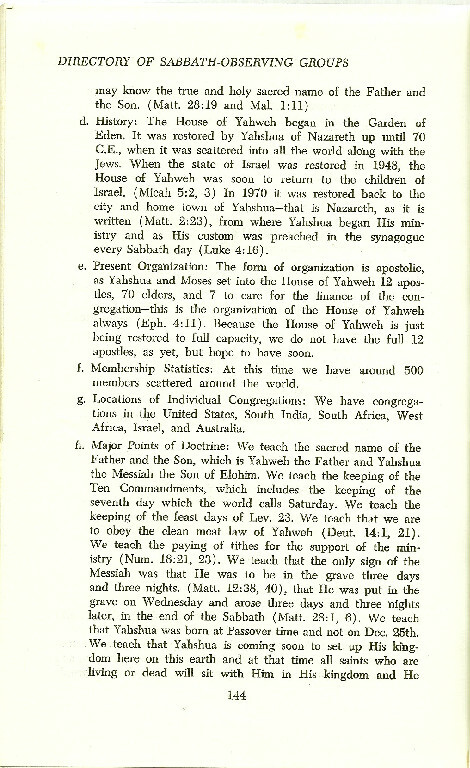 In order to counterfeit his claim of a HOY being established in Abilene, Texas and being on the same latitude as Jerusalem, Israel, Yisrayl printed a similar claim in his magazine and in the books published by the corporate, HOUSE OF YAHWEH. In the 80’s and 90’s Yisrayl Hawkins doctrine paralleled his brothers doctrine, by either opposing it, or counterfeiting it, and fooling the members in his church, into thinking this was his own inspired, doctrine! Before Jacob Hawkins (J.G. 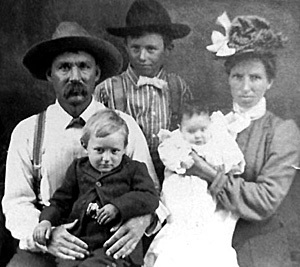 Hawkins) death, Buffalo Bill Yisrayl Hawkins claimed that he and his brother were the two witnesses found in Isayah 44 and Revelation 11th chapter. 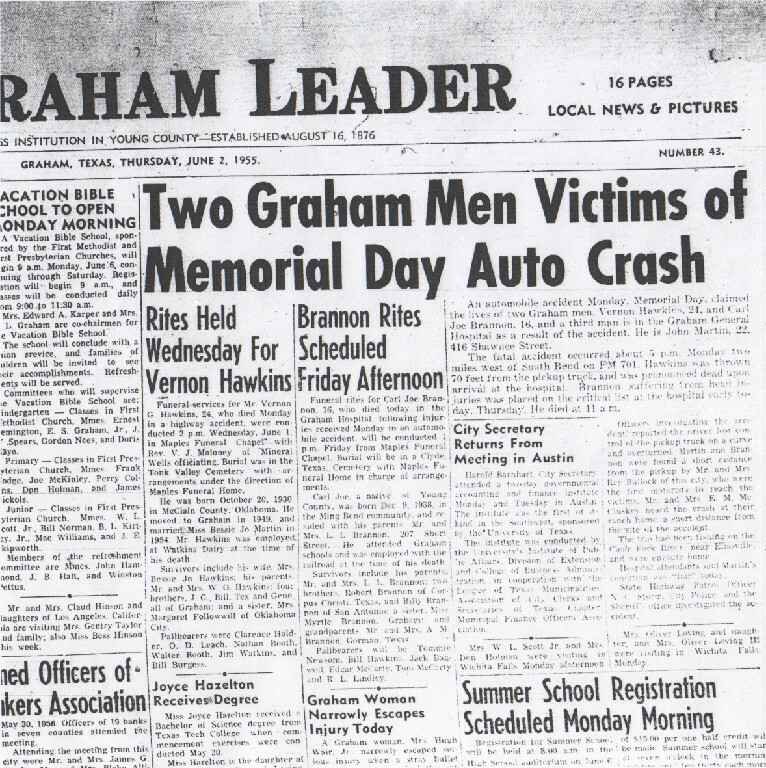 After his death in 1991, Yisrayl had to scramble and re-write the scriptures concerning the “Two Witnesses,” to fit a new theory of his doctrinal interpretation. Below is his brothers gravestone, located in Odessa, Texas, which shows that he is physically dead, contrary to the scriptures in Revelation 11:7,8 which states that the two witnesses would be killed together in the streets of Jerusalem! Here is the Buffalo money used by members who purchase goods from Yisrayl Hawkins businesses. Once members purchase these vouchers with cash, they are non-refundable. They come in various denominations and are worthless paper! The newspaper that recorded Vernon’s death, also verified his date of birth, which is in agreement with his death certificate! 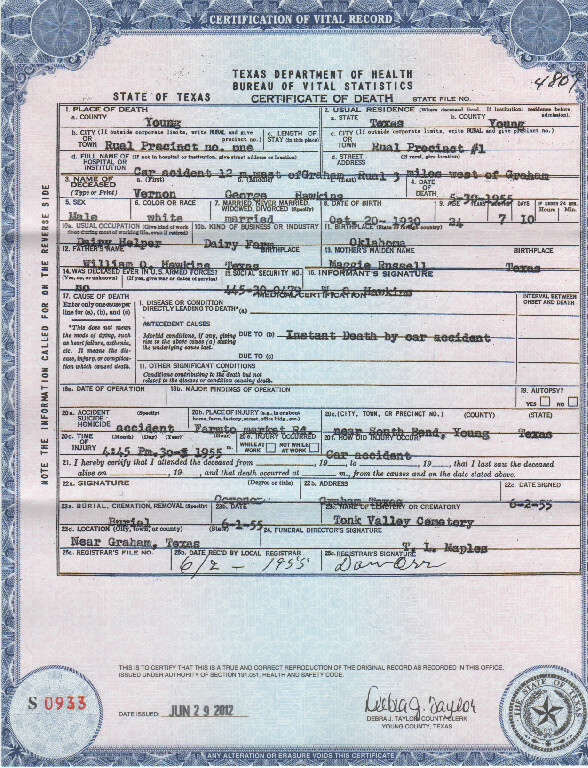 Notice the date of birth is in agreement with the death certificate. 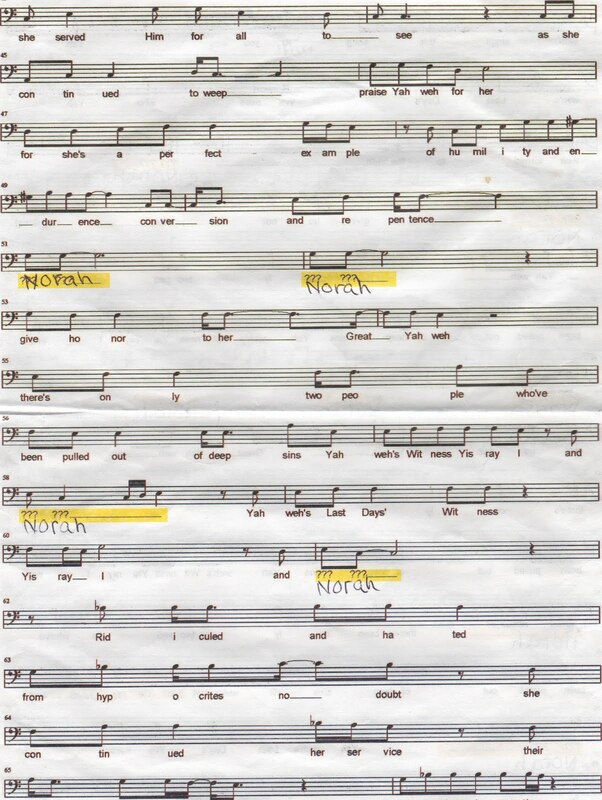 The reason this information is provided to the reader, is because recently, in order to continue the lie, Kahan Chris (Yliyah Hawkins) Hyler, in a sermon dated, June 16, 2012, tried to brush off these records as being inaccurate! 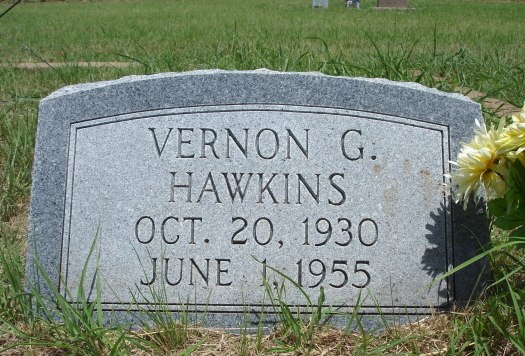 While we know that mistakes can be made, we have presented the facts that Vernon Hawkins, in all available records, shows that he was born October 20, 1930, with NO DISCREPANCIES of his birth! 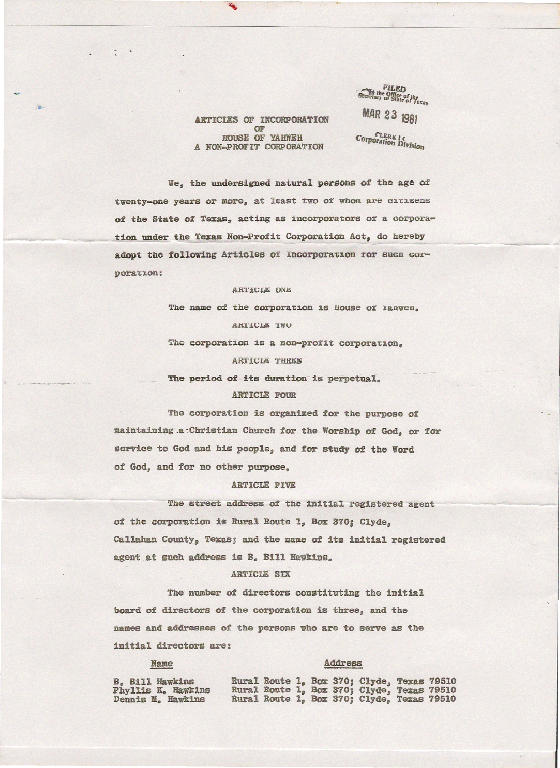 When Chris Hyler was questioned by the author, as to whether he had information about Vernon’s death certificate, he emailed and responded, “yes he did.” When further questioned as to why he didn’t mention this vital information (the death certificate and 1940 Census report) to the members of a HOY, in his sermon, he remained silent and never responded back! He chose to ignore the vital facts concerning Vernon’s birth records and instead chose to tell the members of the corporate, HOUSE OF YAHWEH, that because he believes a lie, it was his option, to continue the lie, to the listening audience that sabbath day. 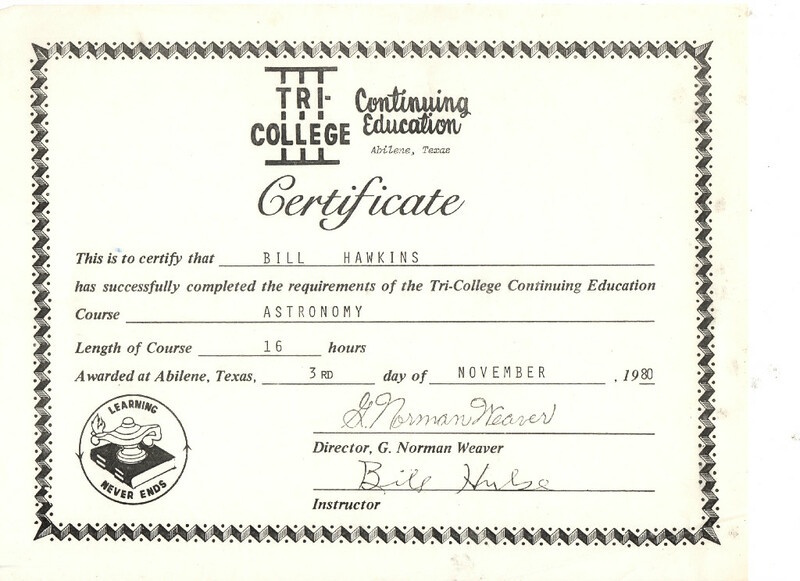 He did everything within his power, at the pulpit, to convince them that they too, should also believe his lies and teachings, of Vernon Hawkins being (according to Chris Hyler) 2 years old when Buffalo Bill Yisrayl Hawkins was born. It seems no one there can get Vernon’s age correct, Kahan Shaul Schneider Hawkins says he was 1, Kahan Chris Hyler Hawkins says he was 2! The author has found videos on youtube, by other members saying Vernon was 11 months old! This is the state of their delusion, to believe any lie, as long as it comes across the pulpit and taught by the hierarchy! As an investigator of truth, it is my duty to go with the facts, until more reliable facts can prove Vernon Hawkins date of birth to be on another date! As of this writing, January 31, 2013, these proofs stand as fact, concerning Vernon George Hawkins. May he rest in peace from the lies his brother, Yisrayl Hawkins has weaved through his church pulpit and dishonored the family name of Vernon Hawkins and also, the family name of the creator, Yahweh! 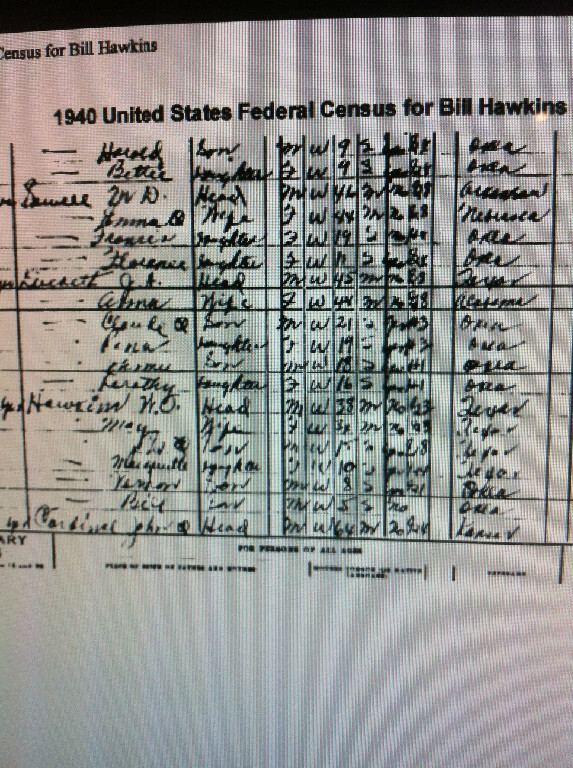 Here is 1940 Federal Census, which was taken in the latter part of 1939. In those days they rounded off the ages of the people, they did not include the year and month of persons births. Notice J.G. was 15, Vernon was 8, Bill was 5. 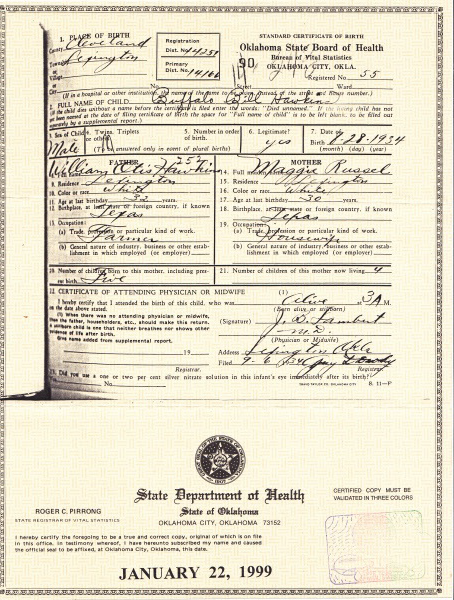 If you look at the above birth/death records you will see it correlates with Vernon being 3 years and 10 months older than his brother Buffalo Bill, which is not even close to the 1 year old brother theory, as claimed by Buffalo Bill Hawkins, and his hierarchy! Vernon’s name is the 3rd line from the bottom, and Buffalo Bill’s name is the 2nd from the bottom. J.G.’s name is the 5th line from the bottom. 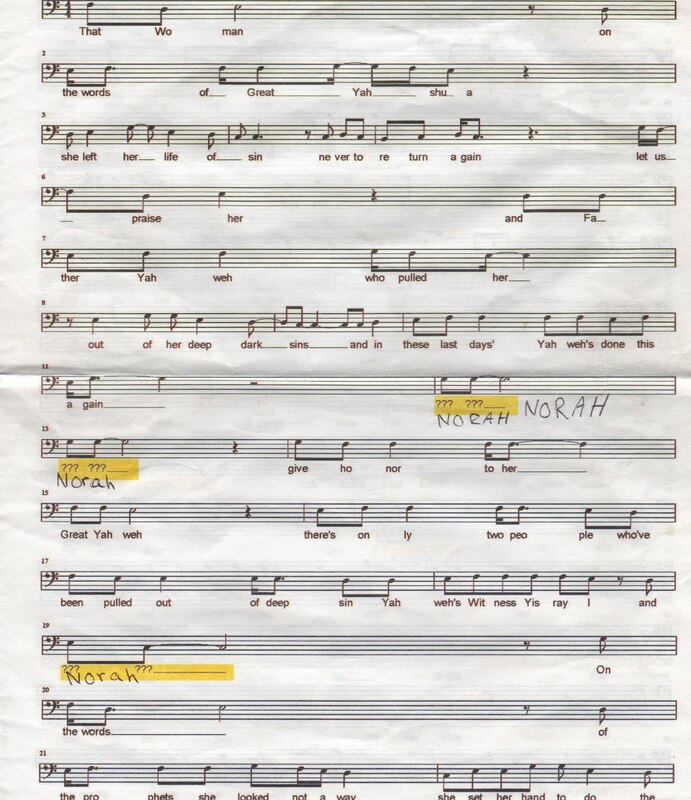 At Yahshua’s Memorial Services, 2012, Yisrayl Hawkins went to great length to bring forth the memorialization of a woman, whom they called, “Norah,” and is supposed to be the Samaritan woman at the well mentioned in the writings of Yahchanan (John) 4:7-42. He is stating this woman, is the one who anointed Yahshua before his death, and then carried on the work of Yahweh after His death! 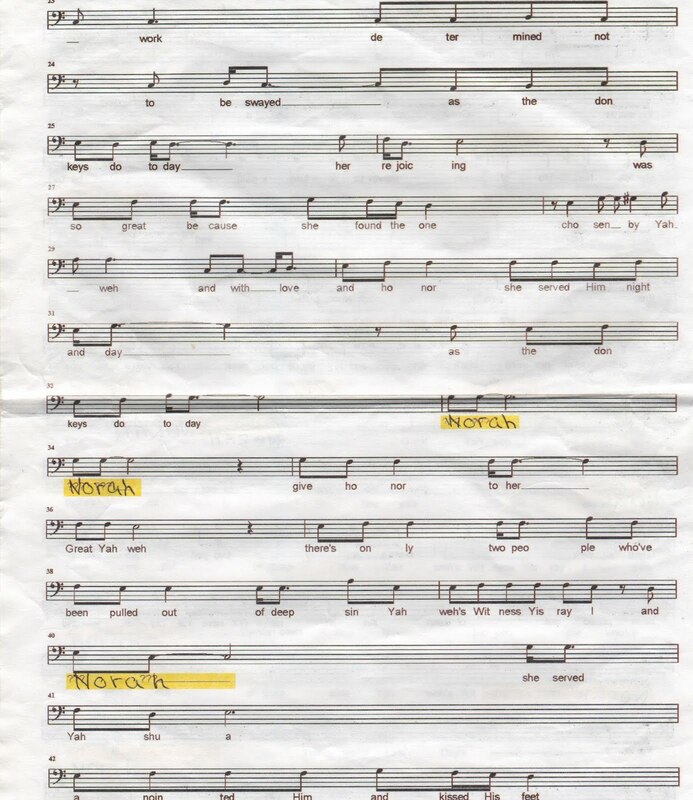 According to Yisrayl Hawkins, she (Norah) and Yisrayl Hawkins are the only two people, who have been carried out of deep, dark sins according to the words of this song. 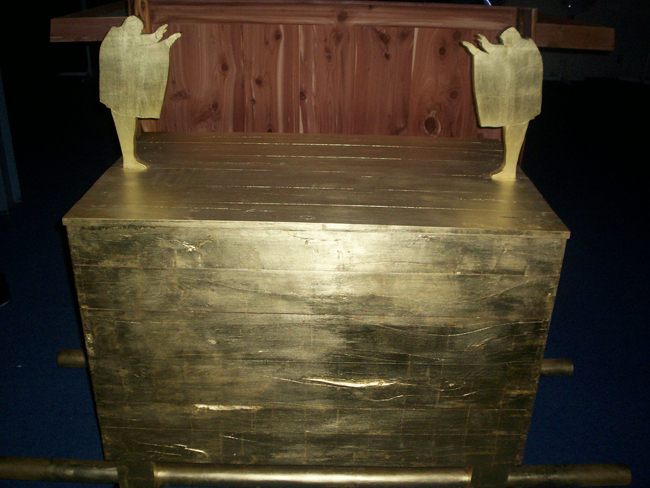 According to Yisrayl Hawkins, they are both memorialized in the word: Menorah. Me, representing ‘Yisrayl Hawkins’ and Norah, representing this woman at the well, thus: Me-Norah! This song entitled, “That Woman,” was sung to his congregation in a memorial ceremony that is to honor this dead woman and Yisrayl Hawkins! 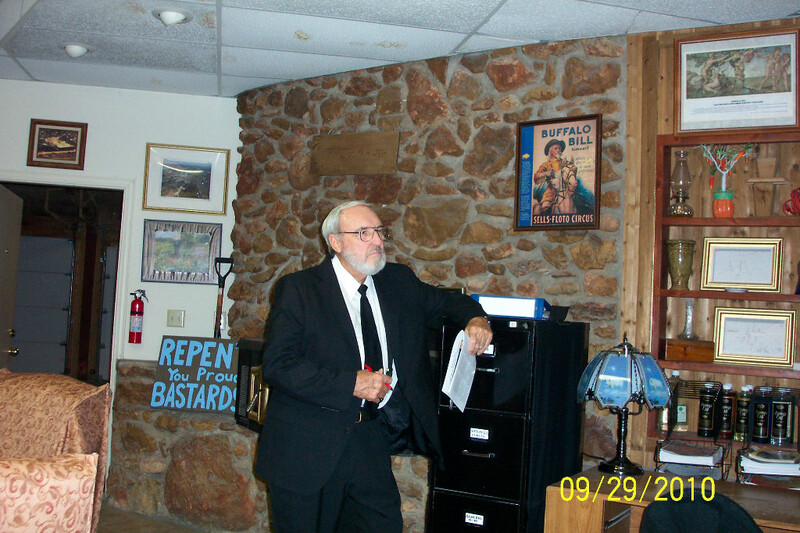 Here is a picture of Yisrayl Hawkins in his office, notice on the shelf an Easter Tree! He condemns Christianity for their celebration of Easter, yet he has an Easter Tree in his office! He also condemns Masons as an evil organization, and yet has a picture of his idol, Buffalo Bill Cody, a 32nd degree Mason, who achieved the rank of Knights Templar! 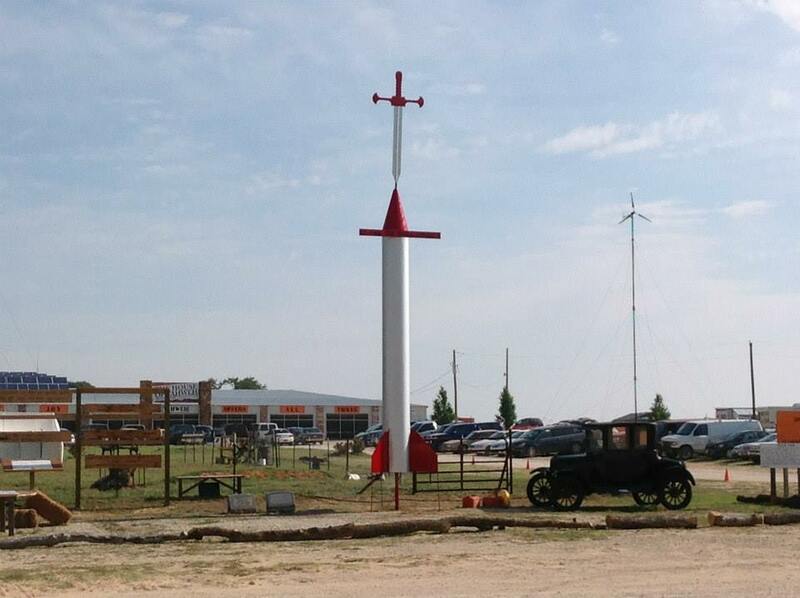 He also condemns Christianity for crosses on their churches, but here is a picture of a cross on his Church grounds! THE BIGGEST COVER UP IN THE CORPORATE HOUSE OF YAHWEH, WAS THEIR ATTEMPT TO HIDE THE SEXUAL MISCONDUCT OF THEIR NUMBER ONE ELDER, YEDIDIYAH HAWKINS. BELOW IS INFORMATION CONCERNING THIS SEXUAL PREDATOR FROM THEIR BLOG SITE! This page from their blog, which was copied and pasted to this site, because as soon as they see any TRUTHFUL, feedback, or comments, about Kahan Yedidiyah (Chris Jandrisevits) Hawkins, which they consider negative, or any questioning, or revealing of the truth, they immediately remove it from their site. Like every religious, mind control cult, the propaganda is controlled by the hierarchy. Shalom. May the Great Peace of Yahweh be with you and the Great Work which is now being done with great strength. I hope that this letter finds you all in the best of health and that you are ready for this great nuclear baby to finally come. I still try hard to follow the news and can put things together, along with the Books of Yisrayl. I am almost finished with the newest one, #11, part 2. It is one of the best, very humbling and strong in the Strength of Yahweh. When you sit down and study it, you can see Spirit Holy jumping out at you and resting on your mind, and it gives your heart and mind the strength to fight against the influences of Hillel. I could go on and on with the interesting things of these great Books of Yisrayl. I can say this much, it helps you overcome at a much faster rate than you trying to do it on your own without them. I hope to be home soon, Yahweh willing. Please pray for me and thewhom Yahweh may be calling. May Yahweh bless you and your understanding. PS: On June 12, 2012 Russia gave Syria attack helicopters to fight against the uprising. Remember the Gulf War series about Syria going down. This is on the date of the nuclear baby. This is part of it. Oh, look this up on the Internet or somewhere: “human microbio project”. They are listening to Pastor, but seeking their own solution. Kahan Yedidiyah will not be released until he repents and brings forth FRUITS of repentance. He must confess his sins to those whom he has hurt. This is the teachings of Yahweh and Yahshua and should be the teachings of a HOY in Clyde, Texas. As his counselor since 1989, I will pray for these things to be done so Yahweh may be glorified, not any man! He never did come clean and to blame the beastly system is just a ploy and tactic, to avoid the truth…. As I read this letter I can’t help but be reminded of the Great Prophets & Apostles of old that were imprisoned by Satan’s beastly system! How even prison bars could not stop them, nor has it stopped the Great Kohan Yedidyah Hawkins from Teaching! This letter just as theirs was, is full of prophecy & teachings of Great Father Yahweh! May we all stand as strong as our Great brother is standing, praise Yahweh! Really what Prophet or Apostle was convicted of child molestation? May Yahweh bless and keep you always…see you soon. May Father Yahweh continue to inspire you & strengthen you with determination to stand strong and endure. Thanks for the homework! We will continue praying, always! May Yahweh gather all His family together soon. Hoy Receptionist · Public Servant at I must be about my Father’s Work! What a great blessing to hear from our great brother. Hold fast to your crown it won’t be long now! The system that holds you is falling! Then our work truly will increase…and you will be one of the ones leading the way! Cant wait to hear our Great Kohan delivering the news again! Thanks to the HOY Receptionist, instead of covering the sin up, maybe he would have been stopped a long time ago!!! You should be ashamed of yourself for covering up sin!!! can’t help but think this will be recorded forever for all to see once this is all over! Just like the letters from the great prophets and apotles of old. I still can’t believe my eyes the events that are unfolding. We eagerly await the return of the Great Kohan Yedidiyah! Praise Yahweh! As one who has been held in the beastly systems prisons, I know the trials Great Kohan Yedidyah is going through! But I know that he is strong for Yahweh, and having the Truth helps greatly! May Yahweh bring His people Home where they belong! Yahweh bless you great Kohan! What a note of refreshing…May Father Yahweh continue to Bless and Strengthen you Great Kohan as you stand fast in the Power of His Might. May Yahweh keep and bless you great Kohan! Praise Yahweh! The Great Kohan Yedidiyah is such a testimony to faithfulness to Yahweh & the One Sent by Yahweh who helped raise him. Reminds me of Proverbs 22:6. Our prayers are always with you and all those in chains who reverence Yahweh! We rejoice in your hope and long to see you on stage again introducing The Greatest Teacher in the World…Yisrayl Hawkins! Don’t hold your breath..unless you can hold it for 25 years..
Praying for you continually Great Kohan! Father Yahweh will bring you back home Great Kohan! This letter reminds me of the determination and zeal of the prophets in times past how they endured thru the most difficult circumstances. May Yahweh continue to strengthen an encourage you thru the teachings of the one sent. Yes, I remember your sermons on how they are positioning themselves in the Middle East like a chess game so carefully crafted and positioned…….for the nuclear baby! Can you name any prophets who were convicted of child molestation??? Shalom Great Kohan. I am greatly encouraged by your letter. I am praying for you and do look forward to your return and I pray it will be very soon. Your letter truly reminds me of those written by the Apostles. Praise Yahweh! this letter is so wonderful ,we miss you so very much.your strenght is inspiring.you are a great example for us all. Some of us may yet need to face the same thing I pray we can all stand as strong.Your love for Yahweh is obvious.Hope you are with us soon. May Yahweh bless u and keep you.Our heart remains with you as you grow in strength despite all odds. Hear oh Israyl,Yahweh is our father Yahweh is one. Though as at the time I and my family came into the Great House of Yahweh, you were already in prison for righteousness sake, we only read about your story from the internet and discovered that it was a complete frame up, now reading this your letter brings tears to my eyes. May Great Father Yahweh continue to strenghten you, bless you and keep you. Yahweh knows all things. may our father strength our greatest teacher the great kohan Abel Hawkins,praise yahweh! He Who testifies these things, says: Surely I come quickly! HALLELUYAHWEH! May this be so! The love of our King,Yahshua Messiah be with you all. It is so awesome to hear from you. Though i haven’t been called into Yahweh’s House as at the time you were away, but i have heard so much great news about you. This letter tells it all. I am so inspired by it. We pray for you everyday, with ernest expectation that you will come home soon to continue to help out in this great work. We are confident that the time is not too far from now. We can’t wait to have you back!….We will continue to pray for Father Yahweh’s protection uponyou. This is truly humbling and energizing. 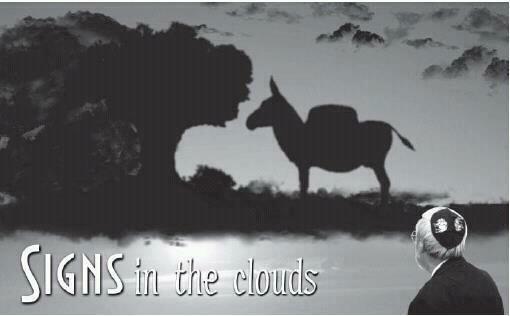 Yahweh is really with His servants everywhere. As the prophets and the apostles suffered yet persisted; by never giving up the righteous work, Kahan you’re a real saint. You telling the whole world that even if they arrest you, they can’t arrest your sense of judgement and they can’t shut you up. I’m far away in Ghana West Africa (poverty stricken continent) but i refuse to allow poverty to prevent me from practicing the Perfect Laws of Yahweh. I really appreciate and it’s a great experience reading from you. I will print and read it loud to our members to motivate them as I am now. now reached every single country in the world. Yahweh Aleichem!!!!!!!!! Shalom Sisters and Brothers (who were once my family), I and my family have been kicked out of the HOY for standing up forrighteousness. I have seen the sins of the priests in the HOY being carefully covered up by Priests and Yisrayl Hawkins. Why not do someinvestigating into what Yedidiyah has done?? Yedidiyah knows what he has done and has to make it right with Yahweh by repenting to Yahweh. What did my family do to get kicked out of HOY??? Also, my head Kepha Arcemont has called the Priests for counseling and no one wants to take his calls and answer his questions…why???? I watch all your commercials and live broadcasts, and it saddens me to think that you want to help the world, but can’t help me and my family! Those who were your family and believe in Yahweh and the keeping of Yahweh’s Torah. Are we to just ” go with the flow”, and except sin? What is sin? 1 yahc 3:4- sin is transgression of the law. Are we to cover up sin? Aren’t we to investigate and out of the mouth of 2 or more witnesses the matter established?? Sisters I plead with you remember the story of Queen Hadassah? How she investigated the plot of Haman and the killing of her people? She investigated the matter and found what was about to take place and she risked her life to go before the King without being pronounced first! She risked her life for righteousness, and found honor. Do we just go with the flow and mindlessly believe man cannot sin? I am a woman of Yahweh, and I strive for righteousness every day of my Life, and those who knew me , know I was/am a woman of Yahweh who only wanted to do the will of my Father. I investigated and found Yedidiyah guilty, and what he did to my family is an abomination to my Father Yahweh, and I hope he repents of His sin. The HOY continues to stand up for child molesters,(Yedidiyah and Sandusky) but won’t stand up for me and my family who have done nothing wrong, but Kepha did investigate a matter of child molestation that has been covered up for many years. Why not prove to me and my family that it is not true?? your father and serve him only!!!!!! I could go on and on, but know one thing: As for me and my House we will serve Yahweh! NEWS REPORT FROM THE ABILENE REPORTER NEWS CONCERNING YEDIDIYAH’S TRIAL AND CONVICTION. to 30 years in prison. Yedidiyah Hawkins, 41, used a vaginal speculum — a medical instrument used by gynecologists — to perform an examination on his then 11-year-old stepdaughter in January 2005. Hawkins told the girl that he wanted to check her for cervical cancer, though he has no medical training, testimony at the trial showed. Lisa Thornton, a former House of Yahweh member, testified that Hawkins was worried the girl was no longer a virgin. Aggravated sexual assault of a child is a first-degree felony, and Hawkins could have received life in prison. The gallery of the courtroom, which seats 48, was full, and more than 10 people — not including members of the media — were forced to stand. Other witnesses for the defense testified Wednesday during the sentencing phase that they never saw Hawkins abuse any of his 11 children. Several of the character witnesses became emotional, teary even, when pleading for leniency for Hawkins. “We need him,” Erica Hawkins, a 16-year-old member of the House of Yahweh, told 42nd District Court Judge John Weeks. never do anything like that,” former sect member Meleana Segura said. Read seemed derisive when prosecutor Shane Deel referred to Hawkins by only his last name. and family while incarcerated in the Taylor County Jail. Jail administrator Lynn Franklin testified that all inmate correspondence is regularly inspected and photocopied by jail staff, and inmates are supposed to be aware that their mail is checked. Wright said in his closing arguments that Hawkins is a man who turned a troubled childhood into a useful adulthood. Deel, Wright said, is trying to smear Hawkins because of his religious beliefs. “He is capable of doing good and deserves a sentence on the low end of the guideline. A very appropriate sentence would be five to six years,” Wright said. appeals on this case, according to the Callahan County district attorney’s office, which prosecuted the case. Buffalo Bill Yisrayl Hawkins has promoted the worship of him as the Lakota Indian prophecy of the White Buffalo Calf Woman. 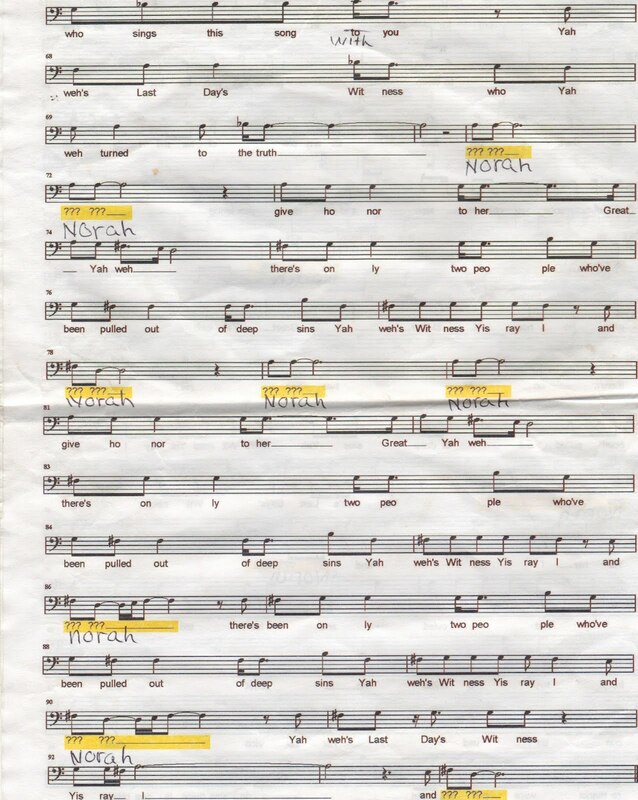 This is an ancient worship from Egypt! 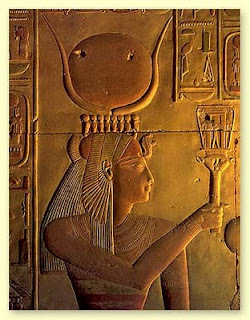 Her name Hathor, Sekhmet, Great One, she was a goddess who was of many names! 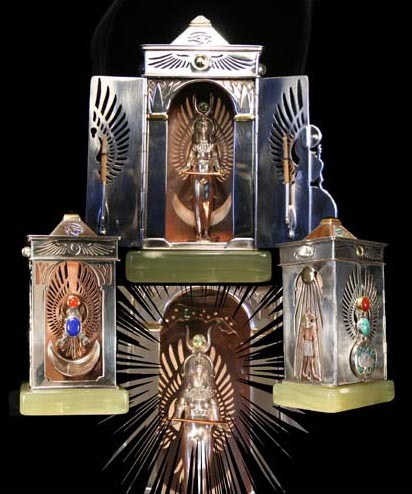 Isis was the principal goddess of Egypt and was worshipped throughout the Greco-Roman world. She was the first personification of the Goddess that I personally worked with. 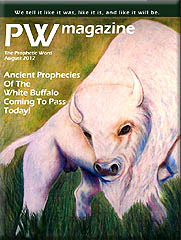 Later, White Buffalo Woman of the Native American tradition became part of my personal mythology of the Goddess. To her worshippers, Isis was known as the goddess of wisdom. 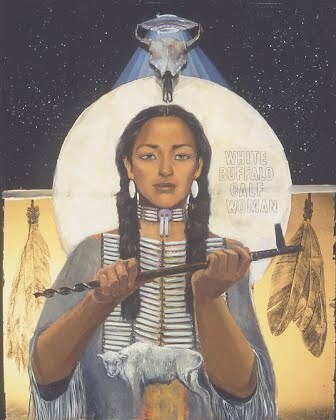 In her hands, Isis is holding the sacred pipe, the gift of White Buffalo Woman. Above her head isHeavenly Mother Nut in the sky with diamonds. associated with both the sun and moon, the earth and the shy. The religion, usually in all forms, is a nature religion. Those worshipping the Goddess worship or care for nature too.